Taking a sincere interest and seeking to fully understand the thoughts, feelings, and beliefs of another could be one of the most important things we can do to change the world around us. How many of your problems and life challenges – not to mention those of the world – are due to breakdowns in relationships and communication in general? How often do you find yourself or someone else engaged in surface observations of others, with a critical or judgmental perspective? How does doing so diminish the relationship qualities including respect, trust, and cooperation? 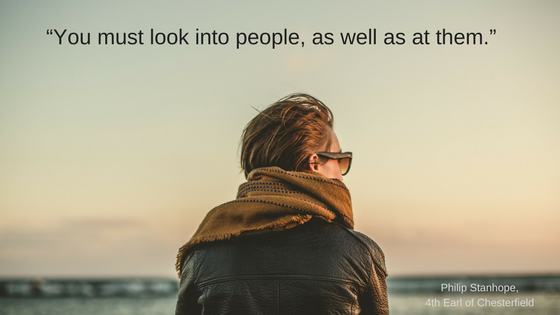 Where and how can you look more deeply into the people in your professional and personal life, to change your world for the better? This entry was posted in Attitude, Beliefs, Relationships, respect and tagged attitudes, Barry Demp, beliefs, Demp Coaching, Relationships, respect, The Quotable Coach by Barry. Bookmark the permalink.